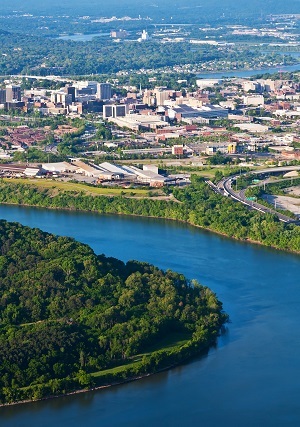 Monarch Air Group provides private air charter in Chattanooga, TN. Our clients benefit from top-notch service, unrelenting dedication to safety, wide selection of aircraft, and years of experience in chartering private jets. To obtain a free quote, please use our online quoting tool provided below, or call toll free 1-877-281-3051. Monarch Air Group provides private jet charter flights in and out of Chattanooga, Tennessee, USA. Chattanooga is a city in southeastern Tennessee, on the Tennessee River, near the Georgia border. With a population of about 167,674 people, it is the 4th largest city in the U.S. state of Tennessee. Chattanooga is the seat of Hamilton County. The official nickname is the “Scenic City”, however a few unofficial nicknames are “Chattown”, “River City”, “Gig City”, and “Nooga.” Notable companies, which have manufacturing or distribution facilities include Amazon.com, Alstom, BASF, Invista, DuPont, Komatsu, Plantronics, Rock-Tenn, Domtar, Alco Chemical, Norfolk Southern, Buzzi Unicem, and Colonial Pipeline. The most popular tourist attractions include Tennessee Aquarium, Walnut Street Bridge, Tennessee Riverpark, Lookout Mountain, Chattanooga Visitor Center, Coolidge Park, Rock City, Hunter Museum of American Art, Creative Discovery Museum, Lake Winnepesaukah Amusement Park, and much more. The city is served by Chattanooga Metropolitan Airport (CHA / KCHA), which is located 10 miles from the center of Chattanooga. 1. APT, Marion County, Jasper, United States. 2. CHA, Lovell Field, Chattanooga,TN, United States. 3. CSV, Memorial, Crossville, United States. 4. DNN, Municipal, Dalton, United States. 5. MMI, McMinn County, Athens, United States. 6. RKW, Municipal, Rockwood, United States. 7. RMG, Richard B Russell, Rome, United States. 8. RNC, Warren County, Mcminnville, United States. 9. THA, Tullahoma/William Northern Field, Tullahoma, TN, United States. 10. TUH, Arnold AFS, Tullahoma, United States. 11. UOS, Franklin County, Sewanee, United States. 1. The DoubleTree Hotel Chattanooga, 407 Chestnut Street, Chattanooga. 2. Holiday Inn Express & Suites ̶ Chattanooga, 440 West Martin Luther King Blvd., Chattanooga. 3. The Sheraton Read House Hotel Chattanooga, 827 Broad Street, Chattanooga. 4. The DoubleTree Hotel Chattanooga, 407 Chestnut Street, Chattanooga. 5. The Chattanoogan, 1201 South Broad Street, Chattanooga. 6. Chattanooga Marriott at the Convention Center, 2 Carter Plaza, Chattanooga. 7. Holiday Inn Express & Suites ̶ Chattanooga, 440 West Martin Luther King Blvd., Chattanooga. 8. Chattanooga Choo Choo, 1400 Market St, Chattanooga. 9. Delta Queen Hotel, 100 River Street, Chattanooga. 10. The Sheraton Read House Hotel Chattanooga, 827 Broad Street, Chattanooga.